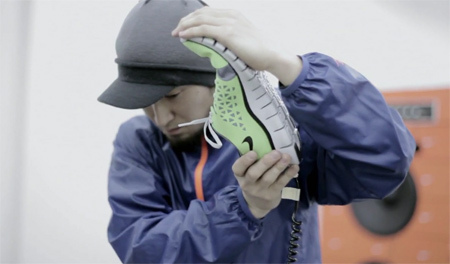 Hifana, talented Japanese musical duo, was commissioned by Nike to write and perform a live song using flexible running shoes as their instruments. Accelerometers and sensors were added to make the shoes interactive. 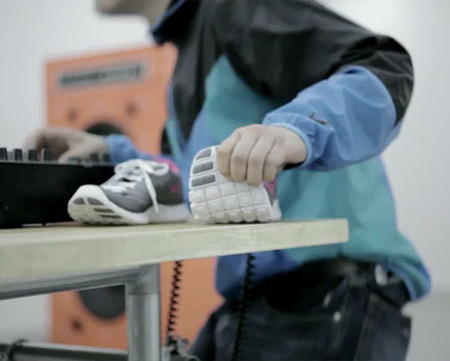 Please note that Nike Free Run+ sneakers sold at retail will NOT make music when bent or twisted. Didn’t think it was possible to have something so cool, pointless and lame all at the same time. Congratulations to those two dudes for being able to get paid for doing something that ridiculous. I thought that video was sick! I’m an inspiring DJ and I think this is a hugely creative approach to an over-saturated art form. Music is music, regardless of how it’s created. If Nike wanted a commercial to demonstrate the flexibility of their shoes and these two men enjoy making music, then I think it’s a perfect mix. Hey, them little kids in other countries should be glad they work in a sweatshop, as least they have a job. Dj’s today always amaze me! Ofcourse everything in that video was fake. What could they have in those shoes which could send a signal like that out of a 3.5mm jack? @Papper- You spelled two simple words wrong in that sentence, and you’re talking about common sense?